The new generation of speed has arrived, and it&apos;s much bumpier than before. The Nike Pro TurboSpeed track kit was released this February after 12 years of research, claiming their newest speed suit (to be worn this summer in London) is the fastest to date. With over 1,000 hours of wind tunnel testing and insight from the fastest athletes in the world, we&apos;ve since seen the Project Swift concept customized for Team USA as well as our international competitors. One of the most unique (and noticeable) features is the recently developed AeroSwift Technology that resembles the dimpled surface of a golf ball. The suit&apos;s dotted texture reduces aerodynamic drag, promoting speed by directing the air into specific patterns— all that wind tunnel research makes sense now. Not everything is bumpy though, Nike kept the interior surface of the suit as smooth as possible so the athletes are comfortable inside their suits. 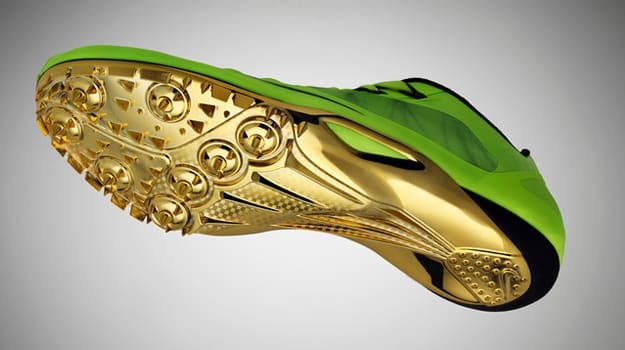 To compliment the one-of-a-kind garment Nike introduced two ultra-light spikes as well, the Zoom Zuperfly R4 and Zoom Victory Elite. Both kicks feature a Flywire upper housed on a lightweight carbon spike plate in gold, of course. Stay tuned as Nike continues to roll out nation-specific colorways for the new models.